When it comes to breath-taking beauty, nothing really compares to the beauties of nature. But jewelry comes in at a really close second! This week’s blog is a celebration of jewels AND nature. 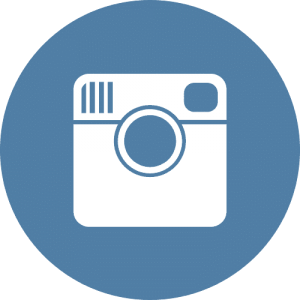 A little inspiration for those engagement and wedding ring set photos! (photo above by Danielle Taufer Photography). 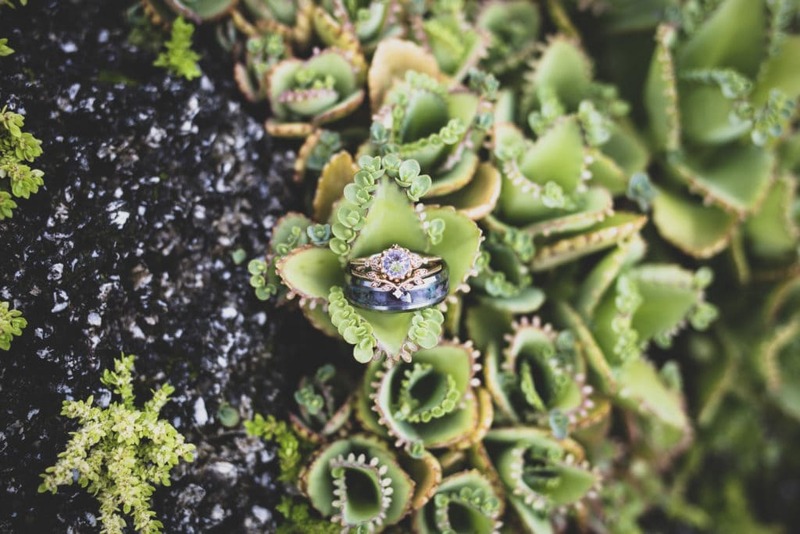 Mike and Julie’s ring set looks gorgeous on this succulent! Julie’s engagement ring is a vintage palladium with natural sapphire and diamonds, Mike purchased the center stone separately, it’s an Alexandrite, a June birthstone, set by Wesche Jewelers right in Melbourne! Julie’s wedding band was also purchased from Wesche: sapphires alternating with diamonds to match the engagement ring. Mike’s is koa wood inlay with black tungsten. But, a plumber by profession, Mike is more likely to be seen wearing his silicon wedding band and saves the real one for special occasions. 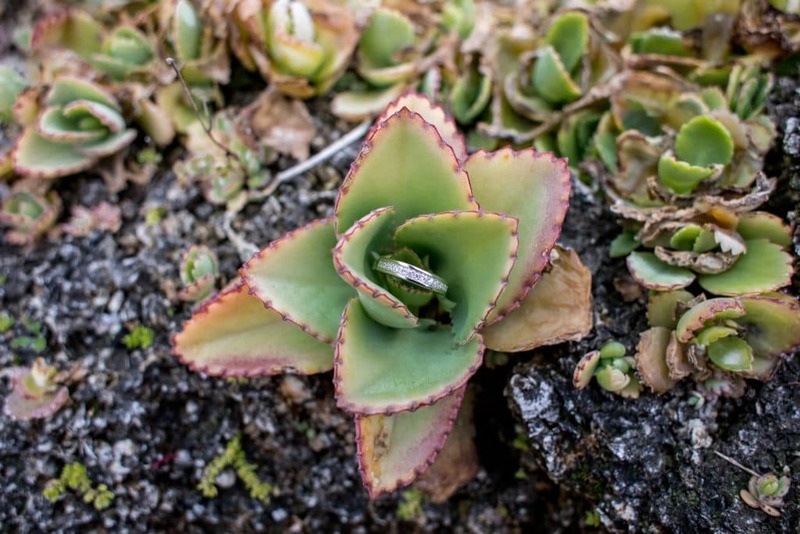 While we’re on the subject of succulents, the mother of thousands kalanchoe makes a perfect little nest for a ring. 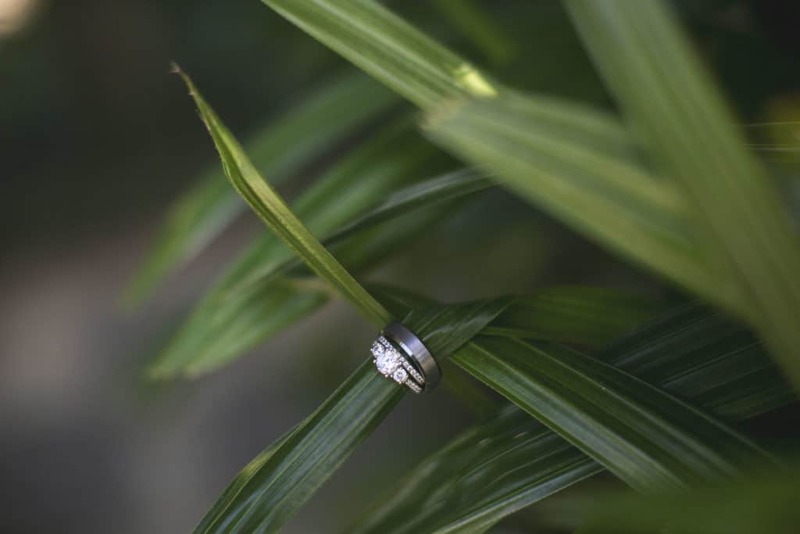 Just like Andy and Sydney’s ring set at the top, Nancy’s beautifully simple diamond inlay white gold wedding band found a temporary resting place in this sweet little plant. 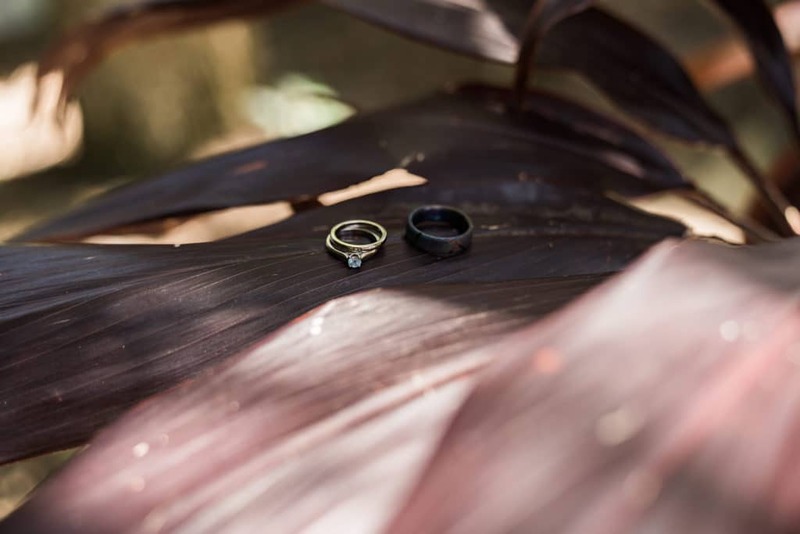 The Lemons, husband and wife photography power couple, chose to balance Maris and Aaron’s ring set ever-so-delicately on the leaf of a cordyline plant! Aaron’s ring is a one-of-a-kind fire-treated titanium ring made by Staghead Designs. 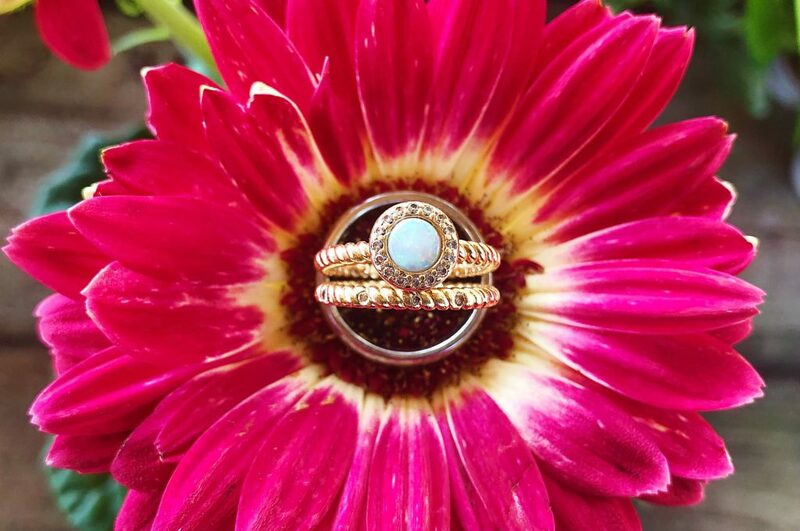 Maris’s rings both come from Fair Trade Jewellery Co. a company that specializes in ethical jewelry. They’re made from recycled palladium and the solitaire stone is a lab-grown aqua spinel from Chathum Labs. How cool is that?! Okay…so we cheated a little and popped MY wedding rings onto this gerber daisy to show you that bright flowers and sparkling jewels can be friends without competing with one another. My husband, scenic artist Joseph Lark-Riley (shameless plug for my talented spouse), worked with jewelry designer Adzia in Chicago to custom design my opal engagement ring in a halo setting with diamonds. Adzia then made our wedding bands from recycled gold jewelry given to us by my mom…the inset diamonds in my band had been part of my parents’ wedding bands. 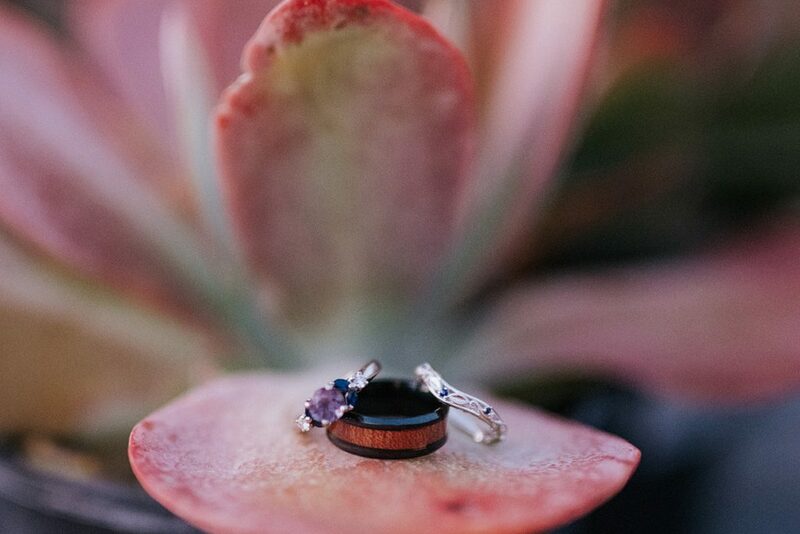 Photographer Kayleigh Jennifer got creative and slipped Allie and Brian’s rings right onto a palm frond! And finally, jewels on jewels. 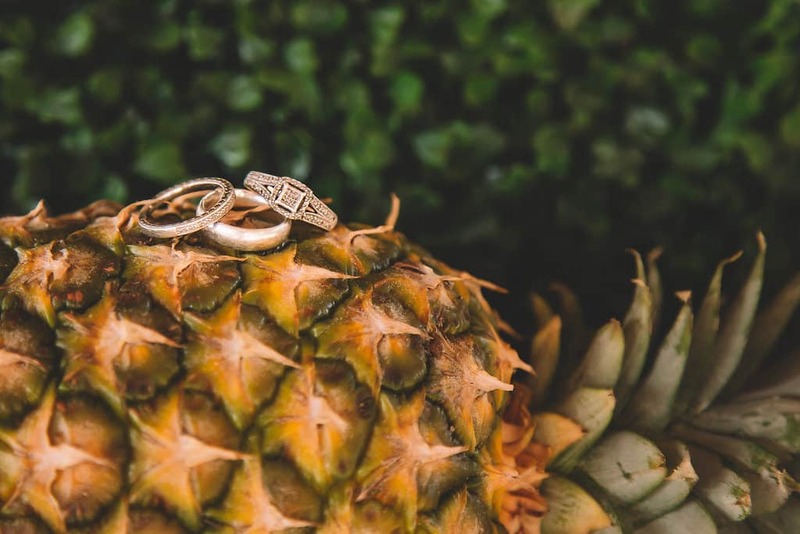 Fruits are the real jewels of nature so Alice’s Art Gallery placed Amanda and Marcia’s ring right on the pineapple from their tropical tablescape!